When you think of the Maldives, white sandy beaches and aquamarine waters come to mind. It is a place where fond memories are created – perfect for special occasions like honeymoons, anniversaries, proposals or simply a getaway with a close bunch of friends. Minus the hype, a vacation in Maldives is pretty much being ‘stranded’ on a beautiful beach and immersing yourself stunning views and complete stillness. While you soak in the sun or gaze far into the infinite horizon, enjoy unrivalled luxury and five-star services that accompany your hotel stay. When in a beautiful sanctuary, choose to stay like a king. Hotels and resorts in Maldives are designed to create the most exceptional experiences for visitors. Over the years, developers and investors are bending their efforts to bring together some of the best properties the country has to offer – transforming Maldives into a must-visit destination for those consumed by wanderlust. More than 20 new hotels and resorts opened in 2017 and 24 new properties have been slated for their grand opening in 2018. Another handful is expected to land on the nation of scenic islands in 2019. In fact, the Maldivian government has promised the development of at least 50 new resorts under the administration of its current president Abdulla Yameen since 2013. With the numbers racking up, the country is pretty much on the right track to seal its status with one of the most thriving tourism industry in the Indian Ocean archipelago. Work is currently underway on a flurry of multi-billion dollar projects across the panoramic islands. Expect some big flagship brands including Hard Rock, Waldorf Astoria and Mövenpick joining the list of upcoming hotels and resorts in Maldives. We round up the most exciting new entries in Maldives for 2018/2019, from the most established names around the world to a boutique-style family hideaway, and plenty of floating architecture in between. The name ‘Sirru Fen Fushi’ means ‘secret water island’ – a fitting moniker for the Fairmont’s entry to the Maldivian hospitality scene. 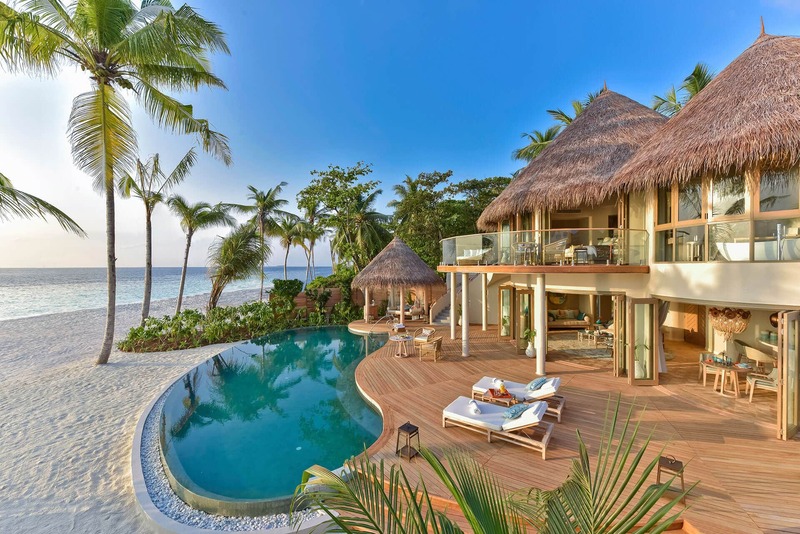 The villas overlook the crystal clear waters, each boasting an effortless charm with a Bohemian bent. Walk out from the comfort of your private villa into the outdoor cabana to enjoy the gorgeous blue horizon or simply dip into your very own private pool. The property (soft-opening in April 2018) also neighbours Maldives’ first underwater sculpture museum created by British artist Jason deCaires Taylor. Hard Rock Hotel Maldives is one of the three hotels that are currently being built in Emboodhoo Lagoon. The globally recognised entertainment and lifestyle brand will also open the Hard Rock Café Maldives, both are scheduled to open in October 2018. The hotel will feature tropical architecture with music, fusing its signature style into the interiors of the property. There will be 178 expansive guestrooms, suites and villas – including the breathtaking two-bedroom overwater villas where you’d stay in style. Located on Muravandhoo Island in Raas Atoll, this chic family-friendly resort, which is set to open end of 2018 will offer a great selection of children-safe amenities and activities including a treehouse, spa for kids, cookery school, treasure hunts and native storytelling sessions around the bonfire. The entry-level villa sleeps three and it goes up to a four-bedroom duplex for larger families. JOALI also provides a whole lot of things to do for adults with four dining establishments, a whisky lounge, spa, art workshops and watersport excursions. Italian hospitality group Baglioni is marking their first property outside of Europe with a slice of la dolce vita to Maldives this coming April 2019. The resort is breathtaking on its own – featuring 96 villas with views of the garden, beach and the ocean. It is a family-friendly resort with a bounty of activities from watersports to a kids’ club. The cabana-style lounges and dining spaces promise great lounging areas for relaxation and a peaceful getaway out of the bustling city life. Scheduled to open this month, Mövenpick Resort & Spa Kuredhivaru will offer 32 beach villas and 70 gorgeous overwater villas that are perfect for both honeymooners and recreational families. The property located in Noonu Atoll includes an on-site diving centre and spa, as well as a marine research centre. The resort is located in a less-developed northern part of the island nation; a stone’s throw away from the Marine National Park Edu Faru as well as the Christmas Three Rock and Orimas Thila dive sites. Maldives will be welcoming another gorgeous resort by the end of 2018 with the Emerald Maldives Resort & Spa putting its final touches to the expansive property. Guests will enjoy over 20 hectares of land and 100 hectares of crystal clear lagoon as they check into one of the 60 beach villas or 60 overwater villas. Located in Raa Atoll, the resort is a mere 40-minute seaplane ride away from the capital, Malé. AccorHotels will be opening another hotel in Maldives and this time, it is on the island of Maamutaa. The hotel group is keeping silent about the big reveal but what we can expect to open by December 2018 is a remarkable beach-fronting cluster of villas, 80 overwater options and 40 on the beach. Its bird’s eye view is simply stunning, as the guestrooms stay afloat above the blue waters – a place to be close to nature. After the successful opening of Waldorf Astoria’s first property in Southeast Asia, the luxury hotel brand is adding another resort property in Maldives come early 2019. The resort will merge three islands in South Malé Atoll, just 20 minutes away from the airport by speedboat. Expect amazing views of the Indian Ocean as you choose to stay in one of the 138 beach and overwater villas. The nature-inspired architecture allows visitors to immerse in the raw beauty of the site. Located in Baa Atoll, a UNESCO World Biosphere Reserve, Centara Grand Muthaafushi Resort & Spa provides the perfect playground for underwater diving and photography. The beautiful coral reefs set the backdrop for the property that is slated to open end 2018, comprising 101 land and water villas. There will be multiple international restaurants, including a highly anticipated underwater restaurant. Additional facilities include a floating cinema, Thai spa as well as a fitness centre with jaw-dropping views. Also located in Baa Atoll, a UNESCO World Biosphere Reserve is The Nautilus Maldives, which is expected to open in November 2018. There are 15 houses lined across the privately owned island amidst the tropical rainforest, while 11 others are overwater along the blue lagoon. Marking its entry as one of the leading luxury resorts in the world, The Nautilus Maldives offers exclusivity with its boutique-sized property. There will also be three restaurants and a poolside bar within the resort.